Abstract: The discovery of the biblical scrolls at Qumran has revolutionized scholars’ understanding of the textual history of the Hebrew Bible. Many textual variants that were previously attested only in the ancient translations or relatively late Jewish literary sources are now known to have been present in Hebrew Vorlagen of the Second Temple period. As recent studies have demonstrated, even where an Ur-form of a given text may be plausibly posited, this fact in no way mitigates the importance of understanding the significance of a textual 'variant’s' (possible) meanings and it impact upon those communities preserving the reading. The present essay addresses one such variant. Specifically, it examines the active and personified nature of the Reed Sea, as reflected in the reading of Deut 11:4 preserved in several post-biblical sources, and addresses the relationship between this textual datum and other biblical and postbiblical traditions of the Reed Sea crossing. 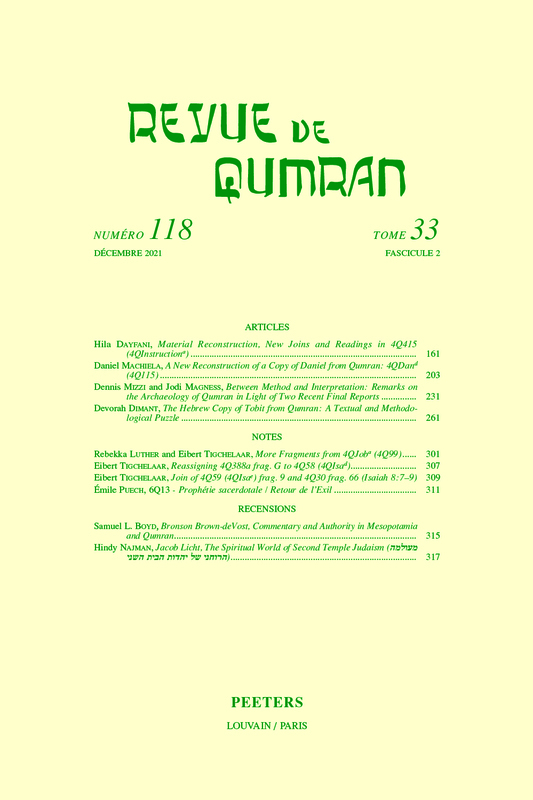 Abstract: This article advances an old–new reconstruction of the debated line 9 of the 'List of False Prophets' (4Q339) on the basis of a fresh look at the text, made possible by the new photographs published by the Leon Levy Digital Library project. This reconstruction is then reinforced by arguments from the field of the study of lists that are brought into the discussion of this text, as it engages several claims previously made in scholarship regarding the form of the List of False Prophets and the internal order of prophets therein. Abstract: The communal meal at Khirbet Qumran was an attested practice, based on these factors: the two large ceramic assemblages found in pantries L89 and L114, and the animal bone deposits found within ceramic vessels, scattered in spaces between or outside buildings all over the site. This paper will inspect both the archaeological evidence for the existence of the communal meals at Khirbet Qumran and the period of time during which they took place. Les repas communautaires à Khirbet Qumrân étaient une pratique attestée, qui fut démontrée sur la base de ces éléments: les deux grands assemblages de céramique trouvés dans les garde-manger L89 et L114, ainsi que les dépôts d’os d’animaux trouvés dans des récipients en céramique, dispersés à l’intérieur et à l’extérieur des bâtiments partout sur le site. Cet article examinera à la fois la preuve archéologique de l’existence des repas communautaires à Khirbet Qumrân et la période de temps au cours de laquelle ces repas ont eu cours. Abstract: The prophet Isaiah is sent to harden the Israelites’ heart. In the history of its interpretation, Is 6,9f. has raised a number of serious theological questions. The present study focusses on its representation in the manuscripts of the Dead Sea Scrolls, notably the great Isaiah-Scroll (1QIsaa VI 1-10). The analysis shows that some of the differences are not confined to the level of orthography and phonetics but have considerable implications for the understanding of the text. Following this presumption, the text attests to a different proposition. It shows the dissociation of Yachad and the authorities of the temple in Jerusalem. 1QIsaa VI 1-10 bears witness to an inner Jewish reception of Isaiah’s prophecy that gives expression to the self-conception of the group. L’ordre donné à Isaïe d’endurcir les curs des Israélites (Is. 6, 9 ss.) a soulevé de nombreuses questions théologiques importantes dans l’histoire de l’interprétation de ce groupement de versets. La présente étude se focalise sa tradition dans les manuscrits de la Mer Morte, notamment dans le grand rouleau d’Isaïe (1QIsaa VI 1-10). L’analyse montre que si certaines différences ne sont que d’ordre orthographique ou phonétique, beaucoup d’entre elles sont pertinentes pour l’interprétation du texte et ouvrent de nouvelles dimensions pour sa compréhension. 1QIsaa VI 1-10 révèle la divergence entre Yachad et les autorités juives du temple. Ce texte témoigne donc d’une réception particulière de la prophétie d’Isaïe à l’intérieur du judaïsme et son utilisation par un groupe spécifique. Abstract: The Words of the Luminaries is a weekly liturgy that surveys Israel’s history from creation to the Babylonian exile. The impression gained from the extant material, however, is that within this historical survey the author tends to emphasize the exodus and subsequent wilderness wandering while glossing over stories from the period of the Patriarchs and Judges. The reason why is because of the typological richness of these stories and their pertinence for contemporary times: the exodus is a story of redemption, rebellion, and spiritual discipline, and as such a malleable paradigm in which to fit Israel’s current state of perceived exile and in which the need for penitential prayer is contextualized. This article will focus primarily on the use of scripture related to Israel’s experience of the exodus and wilderness to demonstrate that the author has artistically woven together a number of scriptural passages tied to these episodes in Israel’s history to craft an extended meditation on the exile and its present-day effects, and to demonstrate that God continues to fulfill scriptural promises to Israel in spite of these exilic difficulties.